These juicy fruit ombrés go from a green grape color to soft banana with honeydew in between. Any imperfection with these tights will not be too noticeable -- seriously these are what I end up wearing myself! However, I do price them accordingly to the flaw so a $30 pair will probably be almost perfect and a $10 pair might have more noticeable flaws. LOOKING FOR A PERFECT PAIR? Visit BZRshop.com for our main collection! 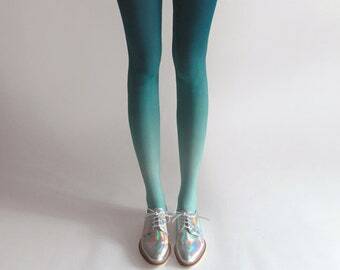 These tights are manufactured in New York, and hand-dyed at my studio in downtown Seattle. Due to their hand dyed nature, slight color variations or imperfections may occur. Part of the charm, right? For International customers, PLEASE check our Shipping Policies! I cannot be responsible for any taxes and duties that may apply. This is my third pair of ombres. They're exactly what I needed to winterize my wardrobe when I moved from NorCal to SoCal. I forgot to enter the coupon code for repeat buyers when I placed the order, and the seller was kind enough to go back and give me a discount.